A newly unveiled indictment against former U.S. House Speaker Dennis Hastert accuses the Republican of agreeing to pay $3.5 million in hush money to keep a person from the town where he was a longtime schoolteacher silent about "prior misconduct." But it offers few hints about a central question: What was the alleged wrongdoing? The concise federal grand jury indictment handed down Thursday accuses Hastert of agreeing to pay the money to a person identified in the document only as "Individual A," to "compensate for and conceal his prior misconduct against" that person. It notes that Hastert was a high school teacher and coach from 1965 to 1981 in suburban Yorkville, west of Chicago. It goes on to say Individual A has been a resident of Yorkville and has known Hastert for most of Individual A's life, but it does not describe their relationship. Legal experts say the fact that federal prosecutors noted Hastert's tenure in Yorkville in the indictment's first few sentences strongly suggests some connection between the allegations and that time and place. "Notice the teacher and coach language," said Jeff Cramer, a former federal prosecutor and head of the Chicago office of the investigation firm Kroll. "Feds don't put in language like that unless it's relevant." No one has contacted the school district where Hastert worked to report any misconduct involving him, school officials Friday said in a statement. The district did not learn of the indictment until it was made public Thursday. Hastert, who has not been arrested, was a little-known lawmaker from suburban Chicago when chosen to succeed conservative Newt Gingrich as speaker. Hastert was picked after favored Louisiana Rep. Bob Livingston resigned following his admission of several sexual affairs. 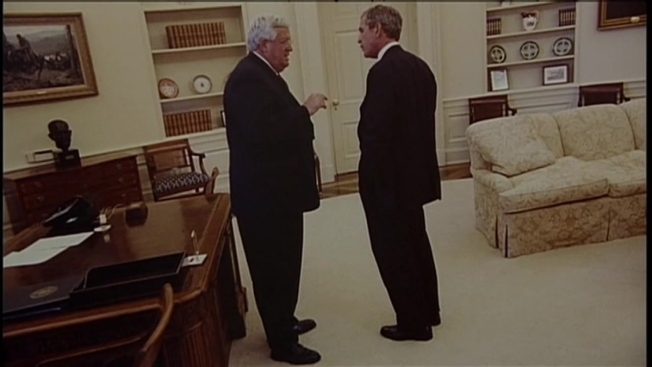 As speaker, Hastert pushed President George W. Bush's legislative agenda, helping pass a massive tax cut and expanding federal prescription drug benefits. During those years, he was second in the line for the presidency, after the vice president. He retired from Congress in 2007 after eight years as speaker, making him the longest-serving Republican House speaker. After leaving Congress, he worked as a lobbyist in Washington. A spokesman for the Dickstein Shapiro LLC law and lobbying firm said Thursday that Hastert had resigned. The indictment charges the 73-year-old with one count of evading bank regulations by withdrawing $952,000 in increments of less than $10,000 to skirt reporting requirements. He also is charged with one count of lying to the FBI about the reason for the unusual withdrawals. Hastert did not return email and phone messages from The Associated Press. A statement from the U.S. attorney's office announcing the indictment said Hastert will be ordered to appear for arraignment. The date was not immediately set. The indictment alleges Hastert withdrew a total of $1.7 million in cash from various bank accounts from 2010 to 2014, then provided the money to Individual A. The indictment says Hastert agreed to the payments after multiple meetings in 2010. It says that "during at least one of the meetings, Individual A and defendant discussed past misconduct by defendant against Individual A that had occurred years earlier" and Hastert agreed to pay $3.5 million to keep it quiet. The indictment suggests he never paid the full amount. Between 2010 and 2012, Hastert made 15 cash withdrawals of $50,000 from bank accounts and gave cash to Individual A around every six weeks, according to the indictment. Around April 2012, bank officials began questioning Hastert about the withdrawals. Starting in July of that year, Hastert reduced the amounts he withdrew to less than $10,000 at a time, apparently so they would not run afoul of a regulation designed to stop illicit activity such as money laundering, the indictment said. Among the focuses of the FBI investigation was whether Hastert, in the words of the indictment, was "the victim of a criminal extortion related to, among other matters, his prior positions in government." The court document does not elaborate. "In most instances, you would view someone being extorted as the victim because they are being shaken down," he said. "But prosecutors have enormous discretion and, in some instance, may see the person doing the extortion as a greater victim. Those are factors that can be weighed." Investigators questioned Hastert on Dec. 8, and he claimed he was making the withdrawals because he did not trust the banking system, the indictment said. "Yeah ... I kept the cash. That's what I am doing," it quotes Hastert as saying. "You won't get anyone to say anything bad about him out here," said David Corwin. "Everybody loved him. The kids loved him and they still do."